Unprecedented innovation in transportation is possible when we turn the torrent of data from sensors and applications into actionable insights. Tapping into the benefits of innovation while ensuring reliability and responsiveness requires the ability to move on fast data for real time insights. This need coupled with high customer expectations and network complexity requires new, insight-driven strategies. Transportation businesses, such as airlines, rail, shipping and more can improve safety and reduce operational costs with real-time monitoring, analysis and diagnostics, enabled by ingesting and analyzing streaming data from billions of sensors and various applications in real time. With InsightEdge, unifying analytics, transactional processing and event-driven workflows simplifies and accelerates the analysis of both real-time time data enriched with historical data providing faster and smarter insights that can instantly impact the business logic for immediate actions. Sharing the information with business stakeholders will improve visibility and collaboration, reducing time-to-maintenance and operational decisions through millisecond scale, just-in-time visibility. For example, one delay can cause a ripple effect across the entire transportation ecosystem affecting multiple applications, processes and business decisions. The ability to create a single source of truth that can ingest data from structured, unstructured and semi-structured data and then trigger analytic workflows in real-time,results in instant insights that can then impact the associated operational flow. Leveraging the vast amount of data in the transportation network enables the prediction of delays, optimization of routes and scheduling, and improves the supply chain. 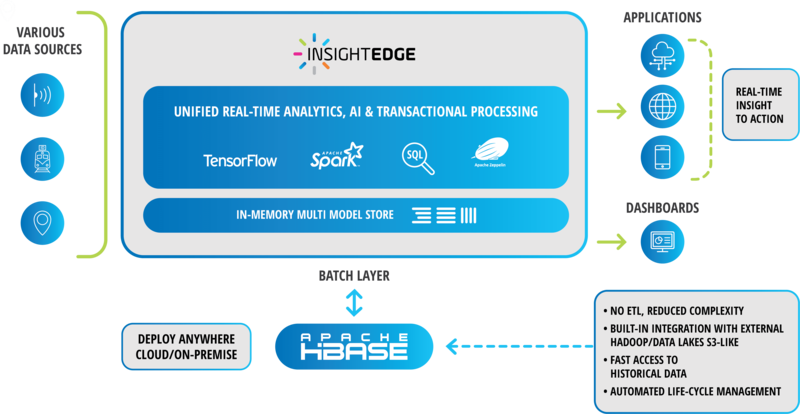 InsightEdge unifies AI & machine learning with transactional processing at in-memory speed, powering the ability to analyze data from various sources such as weather, news, sensors operational applications and more in just seconds or in sub-seconds for actionable insights that instantly impact business operations. Moreover, accelerated simulations can provide the ability to analyze the multiple variables that impact decisions, such as fuel costs whether to delay a flight, add another train to the schedule, and how to comply with industry regulations (such as restriction on how many hours a pilot can work). Analyzing data in real-time and leveraging advanced analytics on additional external parameters such as competitor pricing, operational status, weather, and others, can impact the top line. The transportation business entails many complex, interdependent parameters such as order requests, available drivers, the geographical location of the customer, and more. InsightEdge unifies AI & machine learning with real-time applications to help unlock immediate insights as data is created, empowering time-to-analytics and make revenue-impacting decisions at sub-second scale. InsightEdge provides instant access to real-time geospatial data and other user-level customer intelligence, like flight or train times, layover location, connection duration, and frequent flyer information, to optimize customer interaction and to understand the customer requirements and sentiments. The platform runs machine learning algorithms on the customer profile data enriched with other data sources, like stations information systems, weather data, news feed and more, for insights that are used to provide a personalized experience for customers at the exact time and place they need it the most. This information can also trigger real-time recommendations that are customized for each passenger. Customized offers based on the intelligence gained from algorithmic analysis creates more impact in competitive market segments. Learn how InsightEdge is being used by Transportation Services to become insight driven.